Coconut water is one of the most refreshing drinks nature has to offer. Also known as ‘the fluid of life’, it is the juice found inside a young, tender and green coconut. Coconut water has many beneficial properties along with being very nutritious. It is believed to have been successfully used intravenously during the World War II, to replenish blood plasma levels. Coconut water comprises ninety-five percent want, while the remaining five percent consists of vitamins B, C, and minerals like potassium, magnesium and sodium. A pure cup of coconut water has about forty-six calories, three grams of fiber and two grams of protein; it does not contain any preservatives, unhealthy fats or cholesterol. Since it is all natural and pure, there are no likely side effects and can be safely consumed by people of all age groups. Coconut water has about eight broad benefits among others. As coconut water is rich in potassium and magnesium, salts and sugars, it is often used to rehydrate if a person loses a large amount of fluids due or soon after a vigorous workout. It is also being considered as a better choice by athletes instead of sports drinks available in the market. It helps fight fatigue and restores energy. Furthermore, it works as a great hangover cure. If you are well hydrated your body is restricted from storing fat which in turn will raise your body temperature and a higher body temperature will affect the metabolism in a positive manner. Therefore, it will help you shed the excess weight. Drinking coconut water will keep you hydrated, in addition it will also act as a diuretic that will help pass out the waste from your body with greater ease and speed. Coconut water might lower blood pressure levels as it can increase the effect of medicines used for the same. Some researches and studies have shown positive changes in blood pressure levels in individuals who drank coconut water on a regular basis possibly also in place of plain water. It is loaded with potassium, magnesium and vitamin C, and these nutrients are directly connected to general health benefits apart from lowering high blood pressure levels. Recent studies and researchers have also discovered that coconut water may actually help lower the LDL (bad cholesterol) and increase the HDL (good cholesterol). After a heavy workout muscles tend to be sore, coconut water helps the body by replenishing the lost energy. It further adds to building up the endurance capacity, and facilitating muscle and tissue repair. It is rich in amino acids and potassium which is essential for the proper functioning of muscle action in the body. Being hydrated is the secret to a beautiful skin. Though dehydration can cause many illnesses that affect various organs of the body, having insufficient fluids in the system will cause the toxins to be removed by the body via the skin as well, which may lead to acne and other skin problems. Keeping yourself hydrated is a fundamental rule to a good skin, what better way than by drinking all natural and pure coconut water that will not only hydrate your body but also detoxify it in the process. Moreover, it contains cytokinins that have anti-aging effects. Other than drinking, coconut water can also be used as a mask on the face or to simply wash it with. Coconut water is said to contain Lauric acid which is converted by our body to form an antibacterial that helps with digestion and fighting against intestinal worms, and other infections and parasites in both children and adults by facilitating as an antibiotic as well. Plus, being an alkalizing agent, it relieves heartburn caused by a highly acidic diet. Furthermore, coconut water strengthens the immunity of the body too. Since coconut water also acts as a diuretic it cleanses the body of toxins, aiding the kidney in its function along the way. Besides, medical research has shown that drinking coconut water helps dissolve kidney stones. It is said to balance sugar levels as well; therefore, making it safe for people with diabetes as well. Moreover, tender coconut water aids in the treatment of liver ailments such as hepatitis. A person suffering from diabetes may experience numbness and tingling of the feet, their kidneys are affected along with their eyes. This happens because the blood is unable to circulate properly. Coconut water has the ability to improve the blood circulation and by doing so, it will provide some relief against the symptoms. Moreover, being high in fiber and low in carbohydrates, coconut water is ideal for people with diabetes. 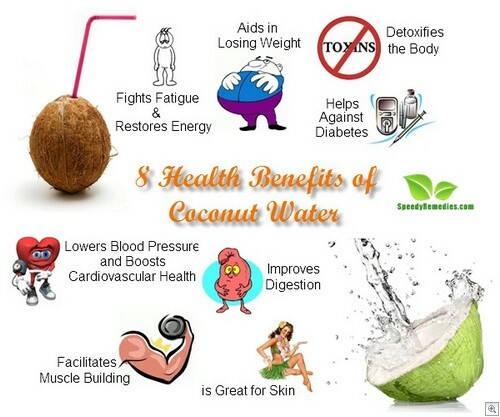 Coconut water benefits almost every individual and because of all the natural goodness that it contains like raising energy levels that in turn make a person feel more comfortable and motivated to follow an exercise regime. Regular exercise, in turn helps achieve the desired weight, which eventually helps the person maintain a healthy body weight. Needless to say, a healthy body wards off illnesses, thereby making it easier to maintain overall wellbeing.